I love the history of the old wild west, and all of the characters that rolled through in the day. Old western movies, tall tales spun out of the wild west, and loads of picture books for kids about some of the varmints that wrangled and won! For Betts and Missouri (Gram) in the state of Missouri, the legends are what shape the town of Broken Rope. Tourists from all over come to hear the stories of the cowboys that road through the area, and unfortunatly most of them typically on the wrong side of the law. Broken Rope had its fair share of murders in the past decades, you would think it would be exempt from anymore. Not so, when it comes to Cozy Mysteries, you have got to have a murder! Betts and Gram run a cooking school in Broken Rope and are in the middle of the summer cleaning when Bett's good friend Jake asks them to house an emergency 'foodie' tour group when the hotel has a mix up. An idea of an all night cooking class with cots available for those who need to rest, Betts and Gram figure they can handle it for one night. The 'foodie' group ends up being a group of retired, wealthy people who aren't overly excited about sleeping on cots in a cooking school. They make the best of it though and Grams tackles the twice baked potato with her students. A newly renovated bed and breakfast owner, Suzi says she can take the group in her bare bones set up if that would help. They are much more excited to sleep dormitory style than on the cots in the school, until 3 of the group come up missing! Jake the town's historian and 'fake' sheriff finds one of the foodies on his office porch, dead! The foodies are in a panic! Betts and Gram are in a panic as they had recently (in the book If Fried Chicken Could Fly) found a dead man in their school. This small town is certainly keeping up it's reputation. Add to that reputation the fact that ghosts actually visit Broken Rope, and can talk to both Gram and Betts! In the midst of the latest chaos and murder, Sally Swarthmore, a legendary ax murderer shows up and asks Betts and Gram to help clear her name. She doesn't believe she commited the crime and that her missing diary can help point to the real killer. Good thing they have history loving Jake on their side who knows they can talk to Sally, though he can't see her. I am not typically one that likes to read about ghosts, but these ghosts are more like historic characters with a sense of humor. I love the history of them, the way they bring the past into the here and now and how Betts has to explain so much to Sally since she has been dead for centuries! 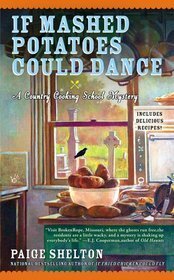 Paige Shelton always keep me guessing with her 'who done it' cozy mysteries and I love finding out the latest adventures of her characters. She her readers a fun, exciting read without anything gruesome or scary. I am a wimp and prefer to have a bit of mystery and fun, without being scared out of my wits! Paige does that wonderfully for me, and has the historic edge that I just love! Looking forward to Paige's next book in the country cooking school, coming out this summer!! This Paige Shelton books looks like a Very Good Read!